South Carolina is The Birthplace of Barbecue and the home of the Official Four Sauces. Discover why the time-honored traditions of South Carolina's "slow and low" keep visitors coming back for seconds. Savor the flavor of South Carolina barbecue. Find your happy plate! Here in The Birthplace of Barbecue, the Great Sauce Debate continues. With mustard, vinegar and pepper, light tomato and heavy tomato sauces to try, you may want to order two helpings of our world-famous pulled pork. The Palmetto State's treasured barbecue recipes call for cooking our pulled pork "slow and low." Discover how South Carolina's pit masters are carrying on this time-honored culinary tradition. Want Great Barbecue? Come to South Carolina. From the basics and beyond, South Carolina's charming pulled pork havens offer something for every palate. Discover heartwarming meals from the mountains to the coast. In South Carolina, love for delicious barbecue runs far and wide. 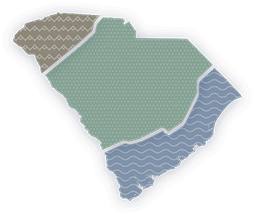 Download a free SC BBQ Trail Map to discover more than 220 family-friendly restaurants from the mountains to the coast. Discover the world of South Carolina competition barbecue, and see from behind the scenes how pit masters from across the state create the Palmetto State's very best pulled pork recipes.